Navy in 1986 and relocating to Washington State. It was in Washington where I first experienced Mexican cuisine including salsa. Eating salsa reminded me of being home when dad would make fresh salads from my mother's vegetable garden. Dad's homemade salad dressings had a twang (sweet and sour) taste that left your taste buds wanting more. When I would purchase store bought salsa I found myself adding additional ingredients to recreate the twang taste I got from dad's salads. One day I added enough additional ingredients to a store bought brand to have made my own creation of salsa. Eventually I began to make whole batches of my own salsa recipe and BINGO Salsa was born. 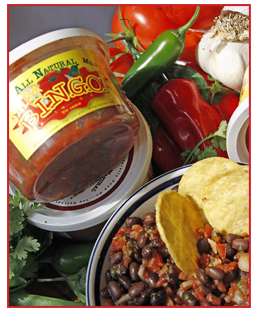 Here it is, several years and thousands of containers later, BINGO Salsa continues to show up on the table of many customers for breakfast, lunch and dinner plus parties and special events. Today, the teenage daughter I desired to be home with then is now a first line manager for the company and she does an awesome job! "WE LOVE IT & can't get enough of it, GREAT JOB!" © 2011-2013 B.I.N.G.O! Salsa. All rights reserved and Trademarks.